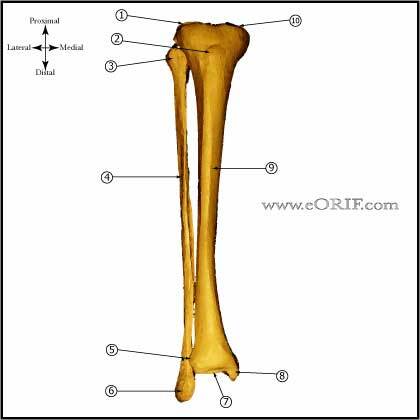 See all Tibial shaft fracture CPT codes. 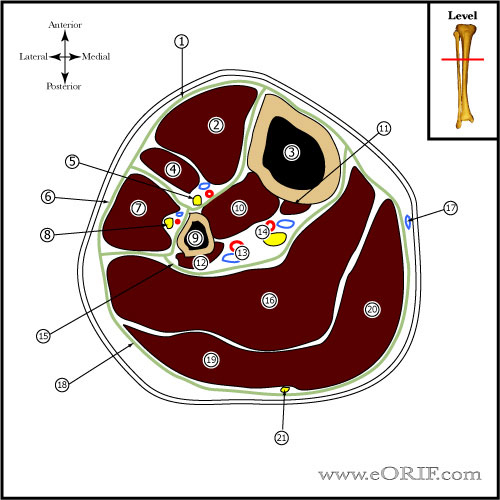 Articular comminution: Consider ORIF vs Ilizarov. Discuss postoperative knee pain with patients pre-operatively. For Proximal 1/3 fractures see Proximal Tibial Shaft IM Nail Technique. Distal 1/3 fractures: reduce and fix any intraarticular extension with lag screws prior to nail insertion. 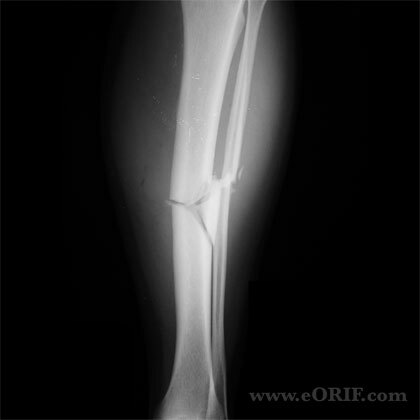 ORIF any associated fibula fracture prior to IM nailing. Consider primary graft vs rhBMP-2 for osseous defects. IM Nailing may be done on a fracture table or supine on radiolucent table. Reduction of the fracture can be achieved with the fracture table, large femoral distractor, temporary two pin traveling traction, or use of an assistant / triangles. Supine position on radiolucent fracture table. All bony prominences well padded. Ensure adequate C-arm images can be taken in A/P and lateral planes. 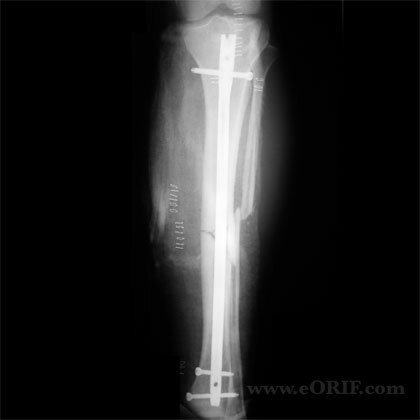 Place 2-pin traveling traction external fixator to reduce fracture and maintain reduction. Varify reduction. Rotation can be assess by ensuring that the second toe aligns with the tibial tuberosity. Use bovie cord to determine entry site-proximally(just distal to articular surface) and lateral generally in line with lateral intercondylar eminence. Dissection medial to patellar tendon. Make starting point with awl. Place ball-tiped guidewire across fracture site. Ream in 0.5cm increments to 1.5mm greater than selected nail size. Measure nail length off guidewire. Place distal locking screws using freehand technique. Back slap the nail to compress the fracture site and eliminate any distraction which occured during nail placement. Place proximal locking screws using targeting jig. Evaluate nail placement proximally, distally and at fracture site using c-arm. Apply bulky Jones dressing with posterior mold to avoid equinus contracture. Knee pain 40-56% (Court-Brown CM, JOT 1997;11:103), (Keating JF, JOT 1997;11:10). Post-op: Apply bulky Jones dressing with posterior mold to avoid equinus contracture. Elevate. Consider DVT prophyaxis. 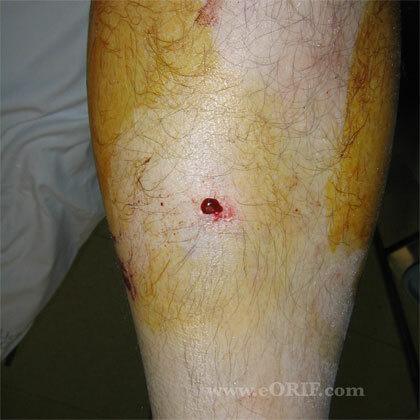 7-10 Days: Remove splint, wound check. WBAT, PT, knee, ankle mobilization based on fracture stability / soft tissues. 3 Months: Xrays. Consider bone stimulator/nail dynamization if union is not evident. Sport specific PT. 1Yr: follow-up xrays, asssess outcomes. 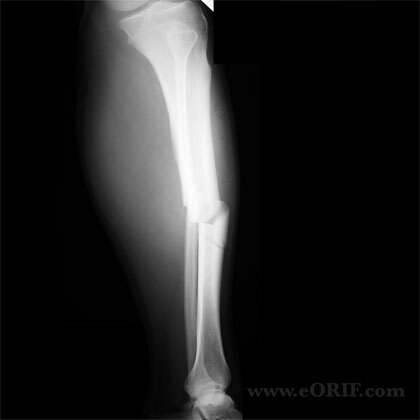 99% union, 7% infection (Bone LB, JBJS 1986;68:877). 67% anterior knee pain for transtendinous nailing; 71% anterior knee pain with paratendinous nailing reported. (Toivanen JA, JBJS 2002;84A:580).